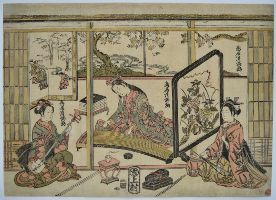 An hosoban benizuri-e showing the actor Bando Hikosaburo II as Sanada no Yoichi Yoshitada in the play Ume ya suisen izu no irifune performed at the Morita Theatre, 11/1763. Yoshitada served the Minamoto Clan and is usually shown fighting his adversary Matano Goro Kagehisa. Published by Harimaya Shinshichi. 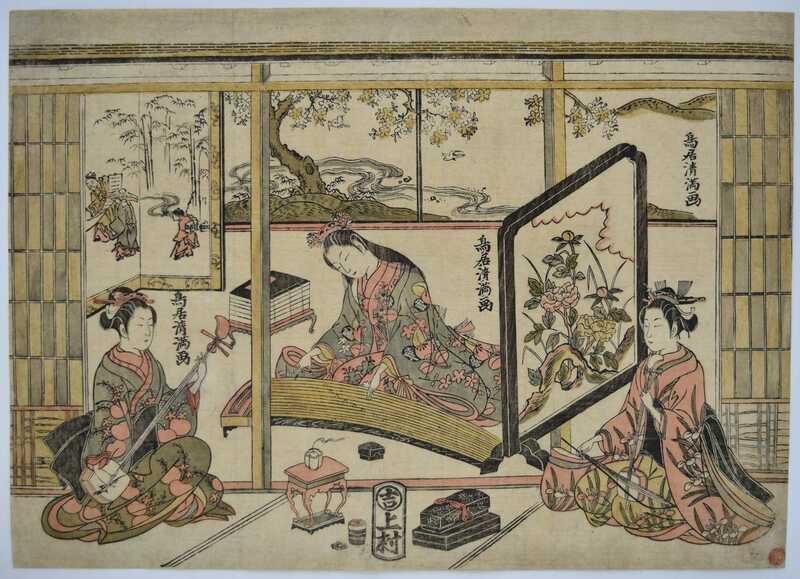 Interestingly, the impression in the MFA, Boston, 06.404, has the publisher’s seal Nishinomiya Shinroku. Possibly a slightly later reprint. Kiyomitsu was the second son of Kiyomasu II. Shows the standing figure of the kabuki actor Ichimura Kamezo I as Wankyu in the play Furiwakamura suehiro Genji which according to the Museum of Fine Arts, Boston, which has another impression (no.21.8149), was staged at the Ichimura theatre, 11th month, 1760. But I have been unable to verify this. Certainly the date fits as Kamezo became Ichimura Uzayemon IX in 1762. Benizuri-e and a pale blue-grey. Published by Igaya Kan’emon. Very good impression and colour. Very slight surface soil, otherwise very good condition. Signed Torii Kiyomitsu ga. The actor Segawa Kikunojo II as the Tennin (a devine being that is able to fly by means of a feathered kimono) from the play Hagoromo, “The Feathered Mantle.” She stands on Miho Beach, the feathered kimono caught in the tree behind her. The story relates how fishermen find the boa but will only return it if she performs a dance. Published c early 1760s. Fine impression. Very good colour: Benizuri-e with beni, green and blue. Some light toning and soil, otherwise very good condition. Signed Kiyomitsu ga with kiyomitsu seal. Fine impression and colour. Slight vertical fold and small expertly restored wormhole near bottom edge. Signed Torii Kiyomitsu ga.